For some more amazing photos of SLR and the DNC in Denver, check out our official photographer Darren Miller’s blog. This (Republican?) 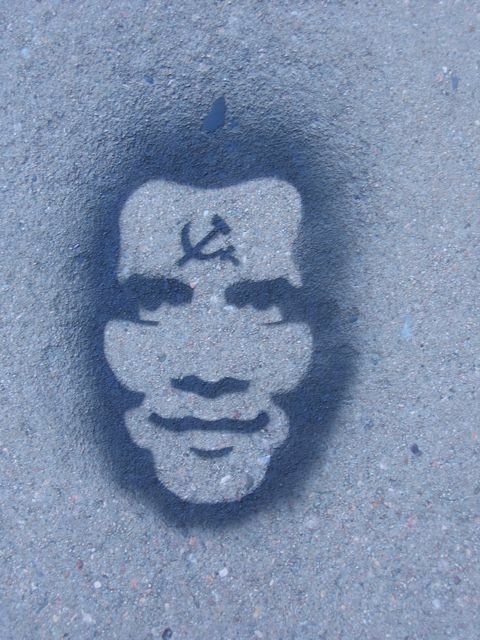 Obama stencil showed up in our Highlands ‘hood overnight this week. The photo is reappropriated from the TIME magazine cover. 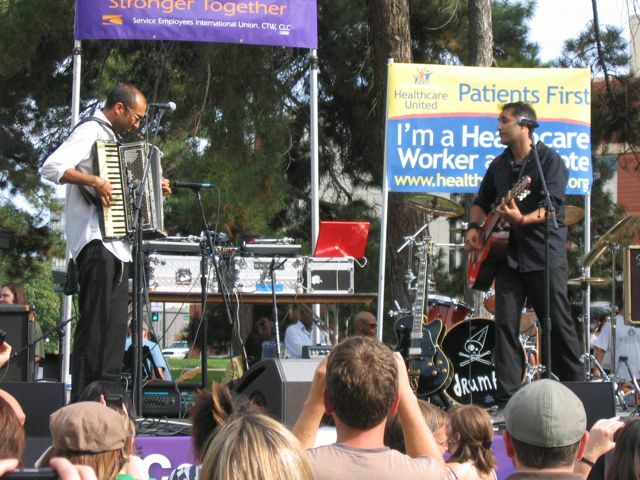 Tom Hagerman (accordian) and Nick Urata (guitar) from Denver band Devotchka (one of my favorite bands) play SEIU’s Health Care Reform rally on Wednesday. Chuck D, Jim Hightower, and members of Death Cab for Cutie also took the stage. I rode a freewheel!n bike out there to flyer and take some personal time. 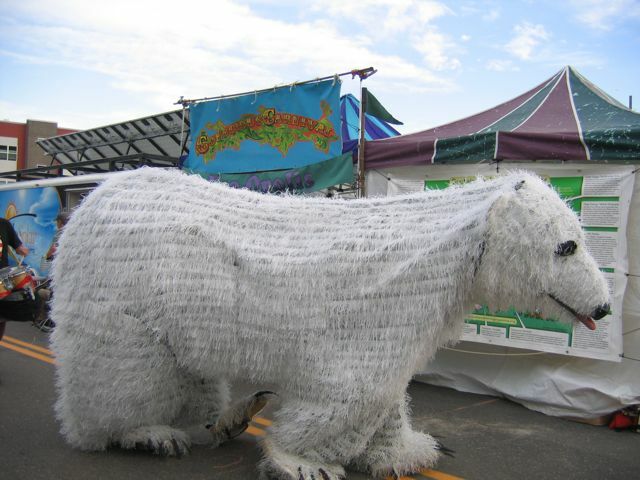 Backbone Puppets walk a striking polar bear through the Conscious Carnival midway in Denver’s Highlands hood. Two people, wearing backpack frames, make the puppet move. They also have a handle that makes the tongue move! SLR will do several collabs with Backbone at the RNC this week. 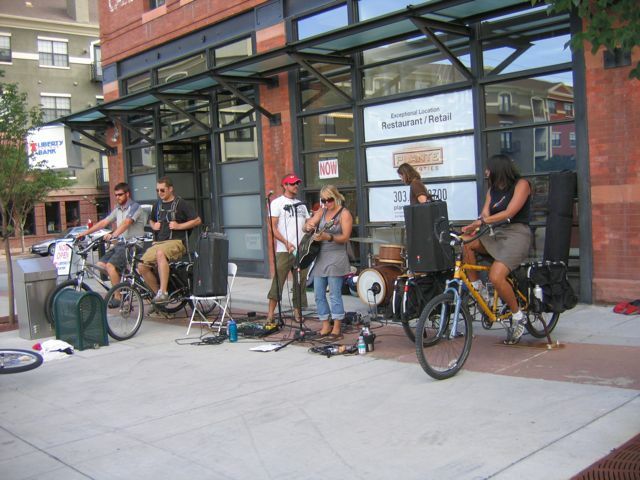 The Ginger Ninjas promote the Roadshow on the other side of the ped bridge (near freewheel!n’s bike station), playing rocking music while people power the PA system via bicycles.